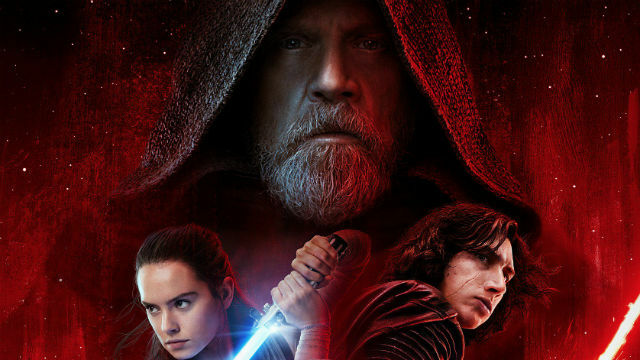 Detail from the poster for “Star Wars: The Last Jedi.” Courtesy Walt Disney Co.
San Diego Family, a monthly magazine in its 35th year of publication, is organizing a fundraiser for the Special Needs Resource Foundation of San Diego (SNRFSD) with a special screening of The Walt Disney Company’s “Star Wars: The Last Jedi” at 6:30 p.m. Friday, Dec. 15, at the UltraStar Mission Valley Cinemas, 7510 Hazard Center Drive, in Mission Valley. Tickets are priced at $55 and $30 per person (higher priced ticket-holders are first in line to choose their seats). Admission includes movie screening, souvenir badge and opportunity drawing ticket, along with popcorn and a drink. Tickets can be purchased at brownpapertickets.com. SNRFSD (snrfsd.org) helps families of children with special needs. San Diego Family Magazine, in cooperation with SNRFSD, publishes an annual resource guide listing resources and services for families with special needs children called Flourishing Families. The next issue (15,000 print copies) is scheduled to be published in March. San Diego Family currently prints 85,000 copies, and each issue is between 60 and 80 pages, with more than 1,700 distribution locations around the San Diego County, including supermarkets, restaurants and retail establishments. The magazine features a calendar of events, parenting tips, ideas for parties and after-school activities and directories covering camps, private schools and creative arts and sports programs. From left: Mindy Collins, director, corporate and community philanthropy Ronald McDonald House San Diego, and Christina Campo, president, HCCSD. Photo via HCCSD. 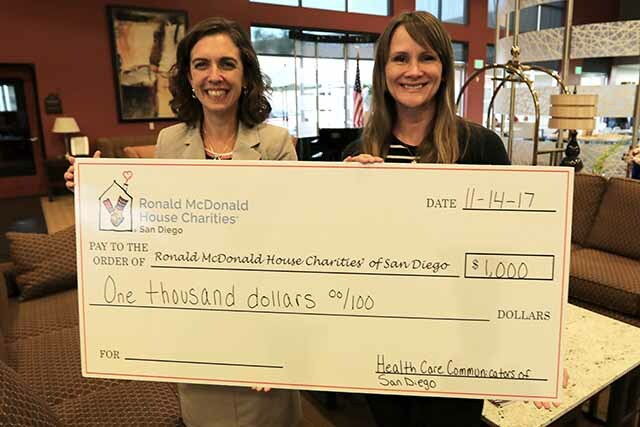 Health Care Communicators of San Diego (HCCSD) recently donated $1,000 to the Ronald McDonald House of San Diego at Rady Children’s Hospital to help families with children under treatment at the hospital. The donation was made prior to HCCSD members serving dinner to the families staying at Ronald McDonald House. According to Christina Campo, HCCSD president, members of HCCSD volunteer four times annually at Ronald McDonald House and donate a portion of proceeds from HCCSD events held throughout the year. It was the fourth consecutive year HCCSD events have benefited Ronald McDonald House. “We are grateful for the dedication and generosity the Healthcare Communicators of San Diego provides to our families each year,” said Mindy Collins, director of corporate and community philanthropy, Ronald McDonald House San Diego. The Ronald McDonald House offers lodging and support to families caring for hospitalized children. HCCSD’s members represent the health care, wellness, biotech, medical device, health IT and pharmaceutical industries. For info on getting involved, visit hccsd.org. SDX, formerly the San Diego Ad Club, and nine other local marketing groups will present the 14th annual Mingle Bells on Thursday, Dec. 7. Mingle Bells is the annual end-of-year party attended by members of professional groups spanning San Diego’s advertising, business communications, marketing, public relations, social media and graphic arts industries. The party runs from 5:30 to 8:30 p.m. at Bassmnt San Diego, 919 Fourth Ave., downtown San Diego. More than 400 people are expected to attend. Suggested attire includes business, holiday, cocktail and 1920s Gatsby. In addition to SDX, attendees will include members of Ad 2 San Diego, American Institute of Graphic Arts, San Diego American Marketing Association, International Association of Business Communicators, San Diego Advertising Fund for Emergencies, Society for Experiential Graphic Design, University of California San Diego Design Lab, SD Direct and San Diego Media Pros. Sponsors for this year’s Mingle Bells include Entravision, Viant and Acuity. Attendees are encouraged to donate blankets, sweatshirts, children’s clothing and gift cards to benefit San Diego Refugee Tutoring, a nonprofit providing one-on-one tutoring and academic support to refugees attending Ibarra Elementary School in eastern City Heights. Cost to attend is $45 per person for members or guests of any participating organization or $65 per person for nonmembers. For info, visit SanDiegoX.org. The San Diego Press Club, along with six other news media-related professional and networking groups, will gather for a holiday mixer with a no-host bar from 6 to 8:30 p.m. Monday, Dec. 11, at the Pisco Rotisserie & Cevicheria at Liberty Station, 2401 Truxtun Road, San Diego. Admission is free. In addition to the Press Club, the groups include the Asian American Journalists Association of San Diego, National Association of Hispanic Journalists of San Diego and Tijuana, Online News Association San Diego, Pacific Southwest Chapter of the National Academy of Television Arts and Sciences, San Diego Association of Black Journalists and Society of Professional Journalists San Diego chapter. 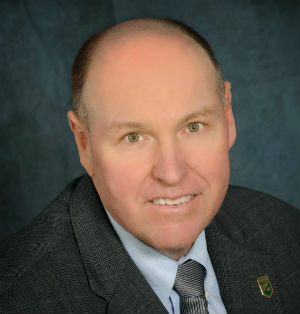 For info, visit SDpressclub.org.